Target wants to track your every move while shopping at its stores. Or at least that seems to be the gist behind the retailers’ new test of transmitters – known as beacons – that link to shoppers’ smartphones through the company’s app, sending coupons, deals, product recommendations and recipes based on their location inside the big box store. Target announced today that it has launched a test what it’s calling “Target Run” in 50 stores, marking it the retailer’s latest attempt to integrate smartphones into the shopping experience. The company already operates the separate Cartwheel app that provides discounts on certain products. 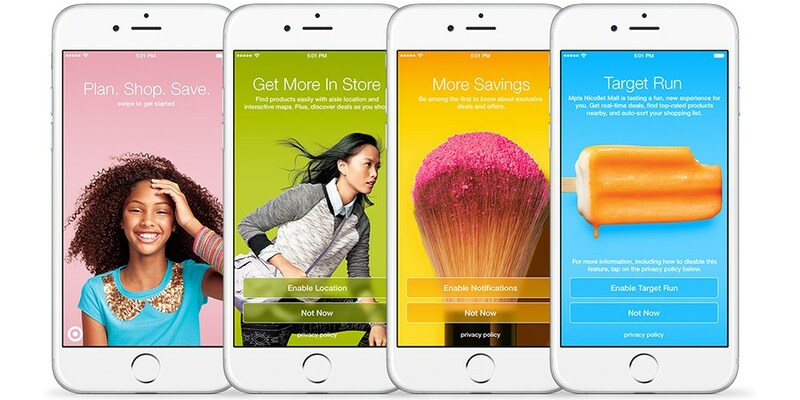 In each of the chosen stores – located in Chicago, Denver, Minneapolis, New York City, Pittsburgh, Portland, San Francisco and Seattle – Target has placed between 20 and 50 beacons on the top of shelves that transmit signals to customers’ phones. For now, the test will only work for Bluetooth-enabled iPhones operating on iOS 7 or higher. To showcase the new system’s capabilities, Target provided The Star Tribune with a demonstration at a downtown Minneapolis store. While walking through the women’s apparel department, the system sent a $10-off coupon for clothes to the top of what Target describes as a social network-like newsfeed on the Target app. When the demonstrators moved to the baby section of the store, the newsfeed updated with a link of the top items picked by third-party site BabyCenter.com. Finally, while perusing the grocery department, the system notified shoppers of a recipe for a smoothie, listing all the ingredients needed to create the breakfast meal. In order to ensure that customers aren’t bombarded by annoying notifications, the system is, for now, limited to just two push notifications per shopping trip. However, if a user leaves the app open or continually sneaks a peek, they’ll see more than two deals or recommendations from the system. Additionally, Target makes it clear that customers who don’t want to be tracked during their shopping trips, don’t have to be. In fact, the company required users to opt-in to the system three times before they start receiving notifications. The company tells the Tribune that if all goes well with the initial tests, it could rollout the system to other stores later this year. In the future, the retailer says it hopes to integrate other capabilities into the system, such as providing the ability for shoppers to page an employee for help or send them reminders based on their shopping lists.